'Yasha' (Hiroshi Shimizu by Carol Warner, R. 2010) SPEC-X (Pseudata); 48", Midseason bloom. 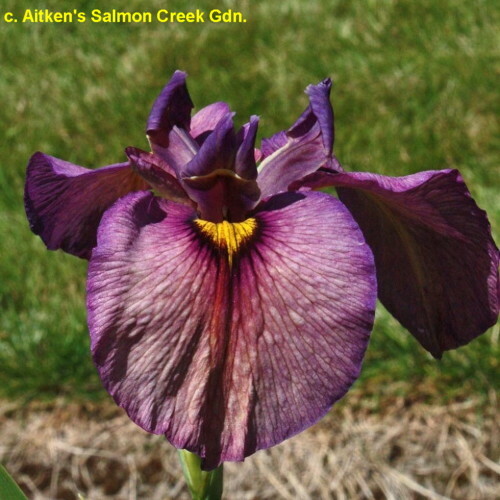 Red-violet Standards and Falls, very deep red-violet eyelash around smaller yellow signal; violet stylearms; color changes dramatically as flower opens. 'Gubijin' X unknown (mixed JI pollen). Draycott 2010. Honorable Mention 2014, Award of Merit 2017.
jpg IMG_9420-X2_yasha.jpg manage 198 K 20 Feb 2016 - 06:24 BrockHeilman Please contact Brock Heilman for image use.